Usually, the news of beginning pregnancy is a time of celebration, but when it is not, a safe and legal way of ending the pregnancy should be available. Jesus can speak to the zygote or even fertilized egg, bless it, and call it back to God’s presence. As Terzo pointed out, they’re not the most convincing. Yet despite spending decades supporting the abortion industry, Riedel recently found herself troubled by it. 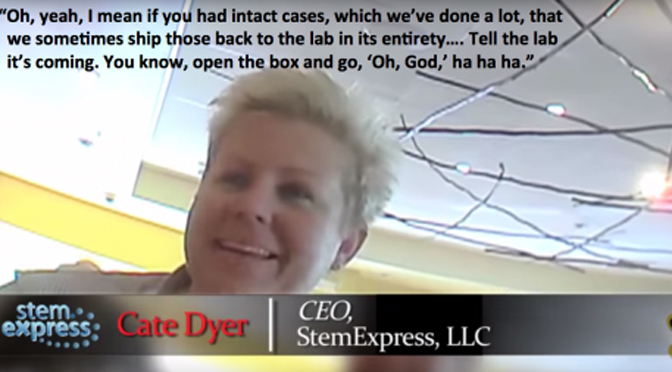 The Center for Medical Progress (CMP) has released undercover videos that show meetings between Planned Parenthood officials and people claiming to be fetal tissue buyers. Riedel wasn’t happy with what she saw. Riedel is correct that abortion staff display a cavalier attitude towards the lives they end. Nine minutes and forty two seconds into CMP’s fifth video, staff at Planned Parenthood’s Gulf Coast affiliate are asked if there are any “fresh specimens” available. They burst out laughing and explain that it’s “been a long day” so the body parts are all “all mixed up together in a bag.” Nevertheless, they manage to find what’s left of a child aborted at twenty weeks. “It was a twin,” one of them remarks. Of course, it’s not just those within the abortion industry who think dead children are good for a laugh; some of the industry’s supporters feel the same way. Any procedure that can erase a massive lapse in judgment while at the same time saving hundreds of thousands of dollars and no fewer than 18 years of responsibility for the welfare of another human being, and can be performed with what amounts to a Black & Decker wet/dry vac from your local Home Depot – that’s a procedure from which I can derive countless hours of entertainment. Max might be a frequent visitor at Planned Parenthood, but he’s not a fan of its decor or of his fellow customers. In a tweet, he compared South Florida to “a giant Planned Parenthood waiting room,” noting the prevalence of “sh*tty design” and “slutty whores.” That may be why the abortion giant turned him down when he offered to make a five hundred thousand dollar donation. But while Planned Parenthood doesn’t want Tucker Max’s money, it’s more than happy to take yours. Over half a billion tax dollars go to Planned Parenthood every year, in spite of evidence that America’s largest abortion chain has committed infanticide, engaged in illegal organ sales, and concealed sexual abuse. And no matter what she’s seen on the videos, Bunnie Riedel thinks that support should continue. Pro-lifers don’t agree. Last month, pro-life senators tried redirecting Planned Parenthood’s funding to the more than nine thousand community health centers nationwide–places where people of limited financial means can get the care they need. Unfortunately, the move was opposed by all but two Senate Democrats as well as by President Obama. You can voice your disagreement with that by signing Live Action’s petition. Because while Ms. Riedel is correct that it’s wrong to laugh at dead children, there’s something that’s even worse: helping them get that way.